Included in the star-studded cast of the new KBS drama, “Iris,” Top of Big Bang showed his excitement at the drama’s showcase held in Seoul’s Cheonggye Plaza on Monday. Some 400 fans and journalists have come to the special event. In his second acting role Top admitted that he’s still getting used to acting and learning a lot from other actors. His first appearance on a TV drama was in another KBS series, “I Am Your Teacher.” He said that acting and singing are totally different things and neither one is easy. 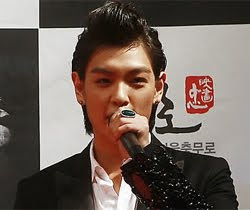 Other members of Big Bang have given Top their steady support so that he can be his best in this blockbuster series. “Iris” is a spy thriller starring some of Korea’s top stars like Lee Byung-hun, Kim Tae-hee, Kim Seung-woo and Kim So-yeon.